S/R is a Decision Area, not an Impenetrable Barrier! It can help to think of Support or Resistance (S/R) simply as a decision area. Too many traders seem to expect their S/R levels to form an impenetrable barrier guaranteed to hold and reverse price movement. Doing so will lead to much frustration and unnecessary losses. The following image is an extract from email in which a trader is starting to look at S/R in the right way and examining the way price moves as it approaches the level. There are several ways I analyse price movement. The method he's discussing here is a subset of what I refer to as momentum analysis. The way price leaves a level gives us a great indication as to the strength of the supply/demand imbalance at the level, and its potential to act as S/R again in future. It can help us in identifying our S/R levels. But we don't trade the past. So the more important information as we consider how to trade on a retest of the level, is found in the way that price moves back to (and at) the level. A great tool for seeing changes of momentum is to visualise the slope of price swings, as I've shown here (this is the same price action as shown in the above chart). See how the upside momentum during A was quite strong, compared to C where it started strong but fizzled out quickly. Compare the bearish momentum on B and D. B was quite weakly bearish, compared to the much stronger D.
See how the change of slope and the length of the push can indicate strength or weakness. At the point the original chart was up to (end of swing F), the market had shown two strong bearish swings (D & F) with a fairly weak bullish swing in-between (E). It's not likely to suddenly reverse then, just because it's testing support. Don't make the common mistake of assuming all S/R will stop price. Think of S/R as a decision area. It will form some kind of barrier to trend movement, and on arrival the trend will either reverse, pause, or continue straight through. 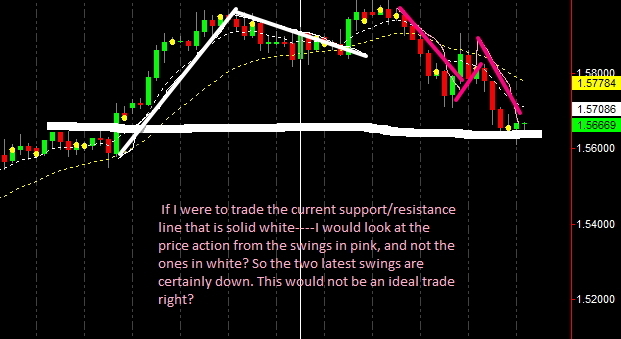 Your analysis needs to consider the internal signs of strength and weakness within the trend to determine the higher probability outcome, and then find the trade opportunity in accordance with that premise. Think of a car approaching a crossroads. It's a decision area, much as S/R is a decision area for price. On arrival at a crossroads, the car may continue straight ahead, it might turn left, it might turn right, or it might do a U-turn. If I asked you to tell me which way the car is going to go as it approaches the lights, you would look at all the internal signs of speed/acceleration/direction for clues. Is it maintaining speed? Most likely the car will proceed straight through. Is it slowing down? This leads to an increasing potential of a direction change. You'll then look for other signs – is it drifting to the left or right of the lane, or even into a turning lane if a multi-lane road. Does it have a turn indicator on? That might narrow the choices down to a turn in one direction or a U-turn. You'll then look further to the degree of deceleration, and rate of initial turn, in order to narrow down those choices further. You will also look at the context of the situation. If the car is slowing down, but so is every other car, then perhaps it's simply because of a red light. So, it's a decision area, not a guaranteed turn point. And an assessment of the internal "nature of movement" will give you clues as to future direction. As a trend is approaching S/R, there are several options for its future movement. It might continue straight through, it might reverse, or it may just pause and move sideways before deciding on one or the other direction. And as a result of this there are several valid options for trade opportunity – a test, a breakout, a breakout failure, or a breakout pullback. Look inside the trend to the changing nature of its movement for clues. 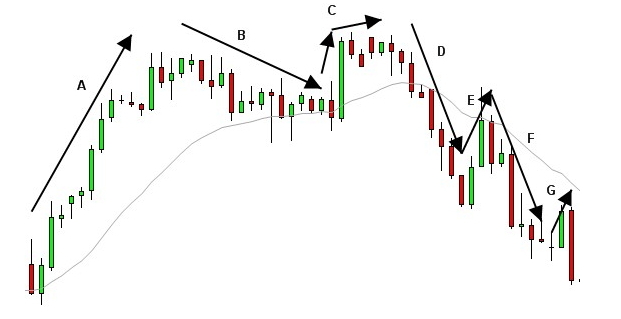 Determine the higher probability direction for future price swings. Identify any potential trades IF that assessment should subsequently be proven valid. And then watch price. If it acts in accordance with your assessment you've got a trade opportunity. If price doesn't act as you expect, conduct further analysis. You'll see clues through momentum analysis, bar-by-bar sentiment analysis, volume analysis, or the use of market internals such as NYSE tick. And yes… the above price chart did continue lower through the support level, before acting nicely as resistance for future short opportunity.